In the fall of 1948 Ernest Hemingway and his fourth wife Mary traveled to Europe, staying in Venice for a few months. He was a year shy of his 50th birthday and hadn't published a novel in nearly a decade. During a hunting expedition he met and fell in love with 18-year-old, Adriana Ivancich, a strikingly beautiful Venetian girl just out of finishing school. It has been alleged that he used her as the model for Renata in Across the River and Into the Trees and that she traveled to Cuba to see him as he wrote, The Old Man and the Sea. Nearly six decades after Hemingway’s suicide, Andrea di Robilant attempts to reconstruct this rarely written about and mysterious relationship in his new book, Autumn in Venice: Ernest Hemingway and his Last Muse. Robilant is the author of several books that include A Venetian Affair (2005), Lucia: A Venetian Life in the Age of Napoleon (2008), and Chasing the Rose: An Adventure in the Venetian Countryside (2014). The author claims that his great uncle was part of Hemingway’s social circle in Venice. Generally regarded as past his prime, Hemingway at the time had been suffering from writer’s block and hadn’t published a book in nearly a decade. One day, he is introduced to Adriana Ivancich and is immediately smitten with the naïvely attractive young woman. According to the author, this relationship “took over his life” and she became his muse. They spent countless hours together in Venice and Cuba, all under the watchful eye of Hemingway’s wife. Meeting his muse around town, Hemingway seemed unaware of the nasty chatter he was generating for Adriana. While his wife, Mary was tolerant of his crush as long as it remained nonsexual and it made him happy. 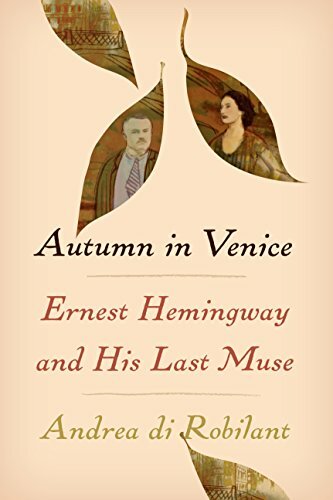 Autumn in Venice effortlessly and expertly explores the secret desires, successes, and depressive obstacles that shrouded Ernest Hemingway’s final productive years. It ultimately falls short of fully answering the basic premise of whether or not Hemingway and Ivancich’s relationship remained purely platonic. In the end, Robilant does succeed in acknowledging that the malicious rumors of the affair did severely impact Adriana and because of such treatment (fairly or unfairly), she suffered years of depression that ultimately led to her own suicide.